f the twelve stories in Exemplary Novels “Dialogue of the Dogs” stands out as a novel that would have “provided an enduring base for Cervantes’s fame as a great prose writer and incomparable painter of his fellowmen,” according to Professor Scheville. In this story, the large mastiff Berganza, along with his mat-mate Cipión, unexpectedly finds himself with the ability to speak. The two dogs have a lot to say and may have only one short night in which to say it, as it is unknown when this gift of speech might be taken away. If that statement has the air of literary arrogance, it is only that he speaks the simple truth. 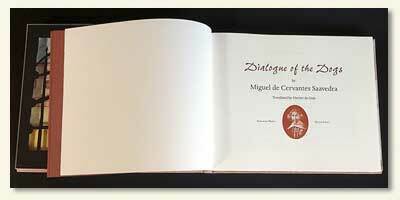 This story by Cervantes has grown in our hearts and has embraced our own antiquated printing presses to give rebirth to the Spanish gentleman’s “Dialogue of the Dogs.” We hope it gives you pleasure, as well. ialogue of the Dogs is published in an edition of 100 copies of which 90 numbered copies are for sale. 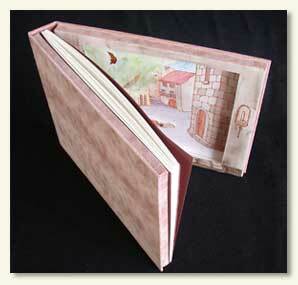 The book is 52 pages and measures 9 1/4 tall x 11 1/2 inches wide and is printed letterpress on Magnani Revere paper and hand-bound at the Press. 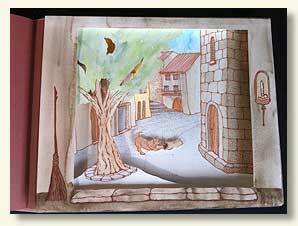 There are full-page scenes set in a three-dimensional diorama in the front and back covers of the book creating a box-like structure around the text. 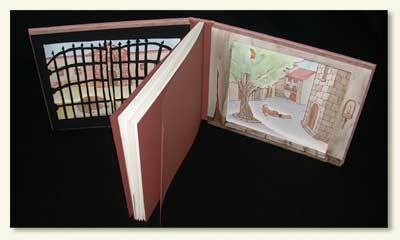 Within the text are additional drawings by Peggy Gotthold. The price is $575.00 plus appropriate CA sales tax. Shipping is $15.00.